As you suffer in pain from injuries you received in a St. Louis car crash, you can't help but feel a little angry. You saw the phone in the other driver's hand and you're pretty sure that cell phone use caused the accident that left you injured. How can you prove it? If you believe that the person who caused your Missouri car accident was talking on a cell phone or texting while driving, there is a way for you to prove that this driving distraction directly contributed to your injury. Cell phone records can show whether the person was talking or texting at the precise time the accident occurred. Talking on a cell phone while driving is not yet illegal in Missouri, but it is still known to be a common culprit of driving distractions. Texting is illegal for Missouri drivers 21 and younger, and legislators are trying to make the ban inclusive for all drivers. To prove that cell phone use caused your accident, you will need to get ahold of the phone company's cell phone records. Getting records of a person's cell phone use is possible, but it can be time consuming. First, you must file a lawsuit and then request the judge to subpoena the phone company to release the phone records for the lawsuit. Getting all the necessary information and proving your case may be difficult to do on your own. 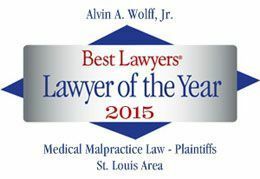 To see how our St. Louis car accident lawyers can help you, call Alvin Wolff, Jr., and Associates toll-free at 877-241-1020. Don't forget to pick up your free copy of our guide How To Pick a Lawyer.